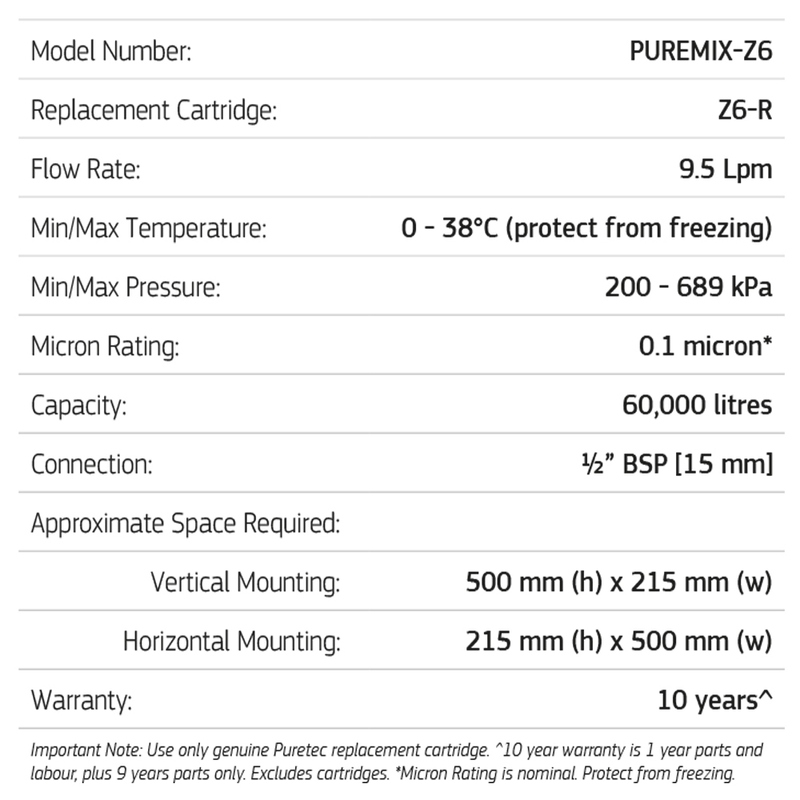 The Puretec Z6-R Replacement Cartridge is made for the Puremix Z6 - High Flow Inline Water Filter System. Simply twist your current cartridge off the filter head and twist on your replacement cartridge until firmly sealed. After installing cartridge, flush for 5 to 10 minutes and your new cartridge is ready to use! With the Puretec PureMix Z6 filtration unit for towns water and rainwater, you can have peace of mind for your family. Even with Australia’s high water quality standards, there can be some unwanted nasties left in your water. This unit is designed to filter out sediment, rust, and dirt down to 1 micron so you can enjoy pure and delicious water from your existing tap. 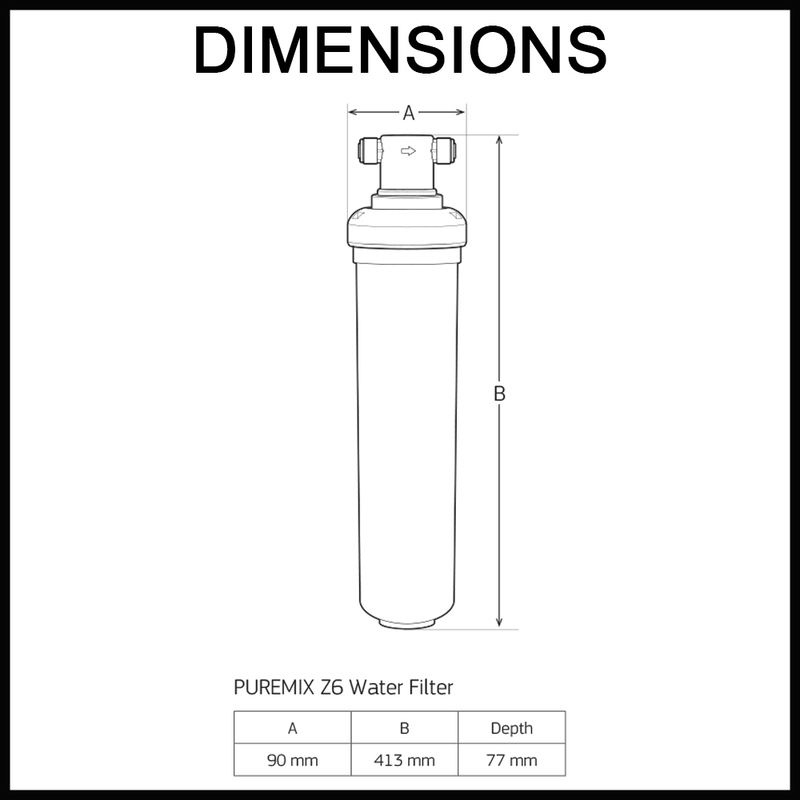 Puretex PureMix Z6 High Flow Inline Water Filter System uses 3 levels: filtering out particles such as sediments, rust, sand, silt, or algae (stage 1), eliminates chlorine, bad taste and odours (stage 2), and prevents growth of bacteria (stage 3). Your family will enjoy drinking only pure, safe, and delicious water! The Puretec PureMix Z6 can be installed horizontally or vertically under your existing kitchen bench and using your existing tap. Utilising the valve-in-filter technology (included in the kit), installation and cartridge replacement also becomes effortless. You don’t even have to turn off the water supply when changing cartridges! This filtration system lasts longer so you actually don’t have to replace cartridges often. The Z6 system requires regular replacement of the filter cartridge to maintain proper operation. Varying chlorine, sediment, or organic substance levels may affect replacement frequency. Be sure to change the Z6-R filter cartridge at least every 63,594 litres or 6 months (whichever occurs first), or whenever you detect a change in taste, odour, or decrease in flow.